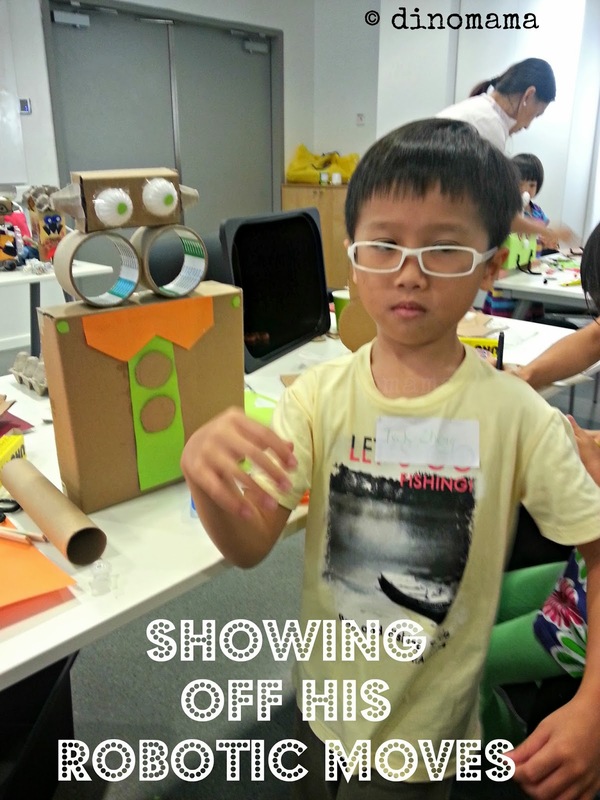 IKEA Make a Friend Contest - Let your kids build an eco-friendly robot! I clearly wasn't thinking logically when I agreed to attend this sneak peek by IKEA Singapore. At that moment, all I can think of is the amount of fun DinoBoy will have with his friends, it only strike me with a "Oh dear... what have I got myself into" feelings when I sat down at the table, staring at the bin of recycled materials in front of me and few robots made out of recycled materials. 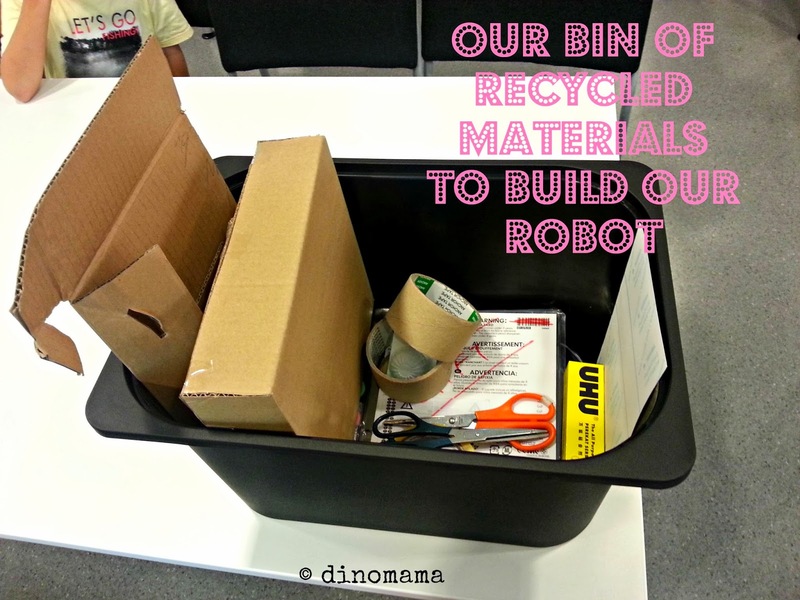 The thing is, I am a sort-of crafty person, I do painting, drawings, sewing but I don't build things let alone build a robot using recycled materials! And if this mama don't do it or don't know how to do it, chances are the boy will be clueless too with a high chance of seeking my directions/instructions to try to "create something out of many things". After a little brief discussions and a little suggestions from me, he started to build his robot on his own. Even though he looks confident in handling the scissors I was still a little bit worried and kept asking him "Do you need me to cut it for you? ", of course he turned my offer down (gently then irritably hahaha~). He did ask me to help with cutting out egg carton as the material was too tough for him to cut. I got hysterical when DinoBoy used the UHU glue, he squeezed the tube too hard each time which caused the glue to over flowed and dripped onto the table, threatening to stick some stuffs onto them and perhaps destroy parts of the robot. 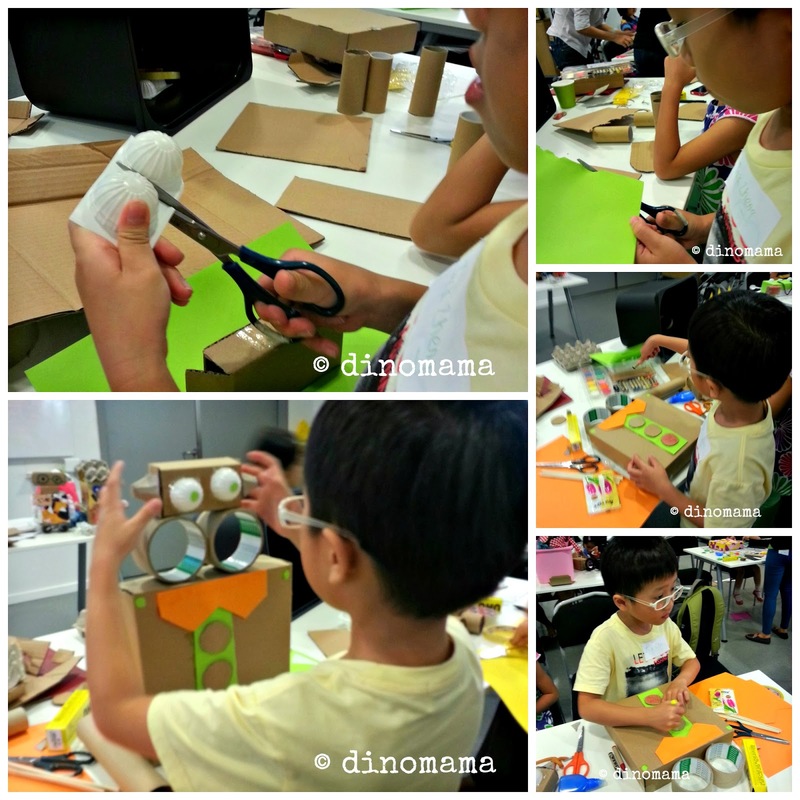 TA-DA~ DinoBoy's first eco-friendly robot! 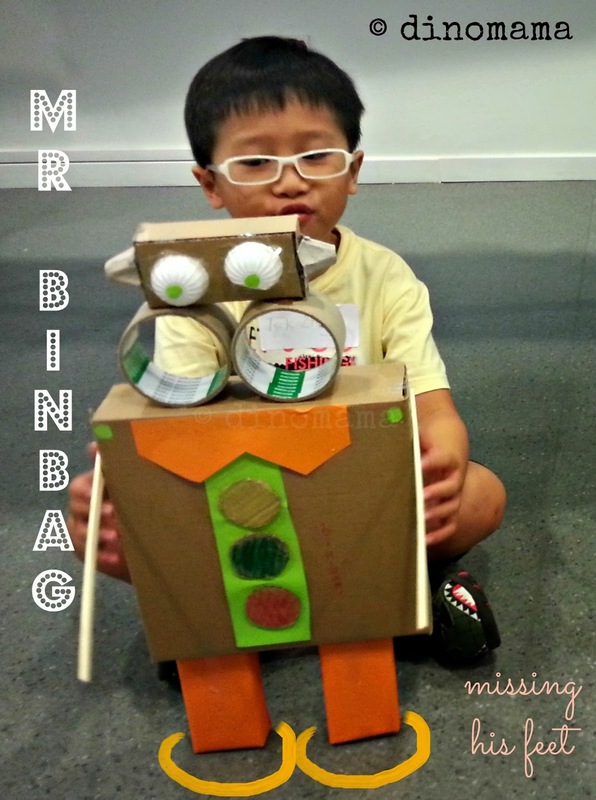 DinoBoy had wanted to name his robot Mr BinBang but he mis-spelt it and it became Mr BinBag instead. We had so much fun building and decorating the robot that we forgot about the arms! Luckily I was able to find 2 wooden chopsticks and DinoBoy quickly stick them onto Mr BinBag. However we ran out of time and Mr BinBag ended up with no feet, never mind that as we still love Mr BinBag with or without his feet. I am so proud of DinoBoy. For a boy who only plays with LEGO to construct and build vehicles and buildings, he sure did a great job in building his very first robot 98% on his own! Even though this is the first time both of us are doing this, He showed me that some times I just have to let go of my hands and let him take charge on certain things, in this case his creativity side, he has also show edme that he can accomplish more then I perceive he could. 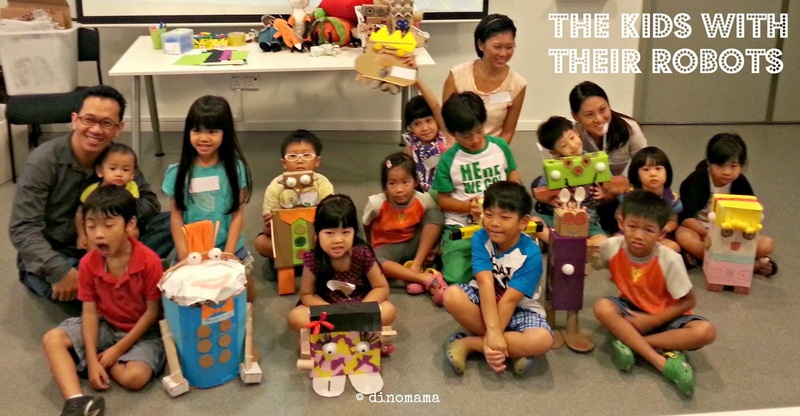 Here are the kids with their very own version of eco-friendly robots~ Aren't they all unique and exquisite? It is a competition open for mummies, daddies and kids. Each family will have 1 hour to make a ROBOT together. The best looking robot will win $500 worth of IKEA Children's furniture & gift card. Not a FAMILY or småles members? It's ok, click here FAMILY and here småles to find out how to sign up as member. PLUS, IKEA will turn the winning creation into a big, life-size robot and show it off at both IKEA stores! Registration : only can be done online from 28 October 2013 to register online. 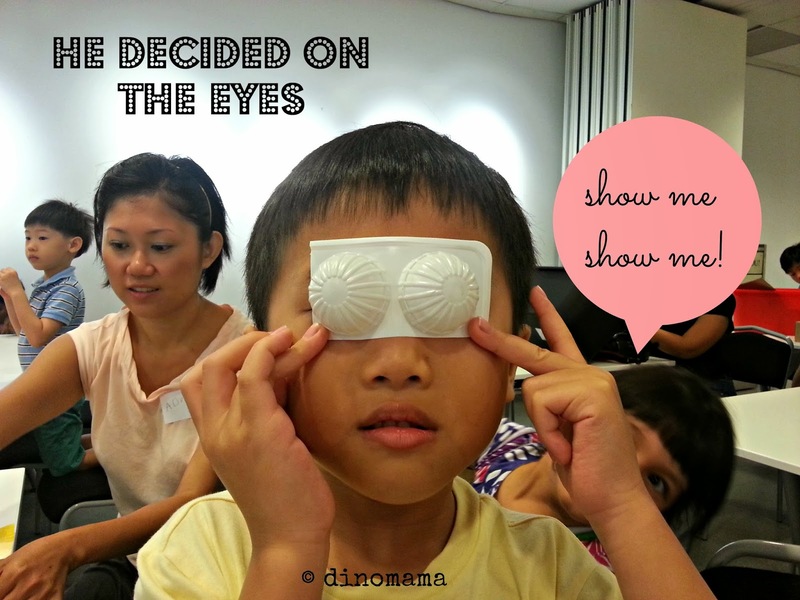 Disclaimer : We were invited by IKEA Singapore to attend this Blogger Preview Party on 26 October 2013. We were not compensated for this post and all opinions of the event are 100% our own. LOL at Poppy's "show me show me!!!" I had a good time at your table, partner! Its not my table, its OUR table~ hahah~ we had fun with you & Poppy too! nice to finally meet the Dino family. I was so worried when my kiddos start snipping away with their scissors. DinoBoy is so Adorable! So enthsastic in making his "friend".